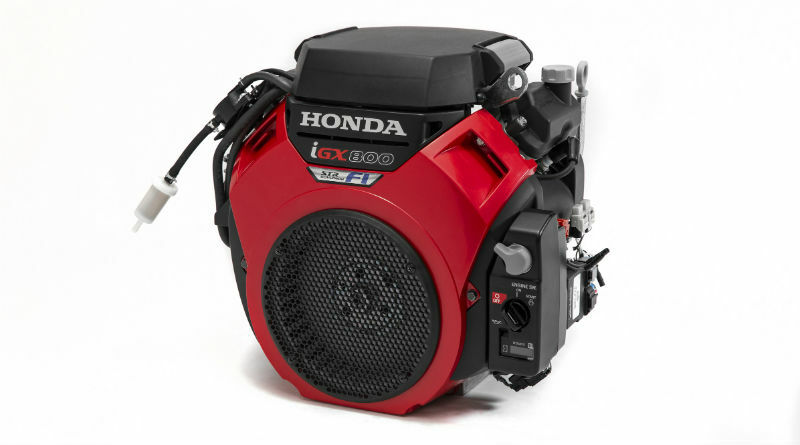 Honda Power Equipment recently announced new additions to its line of commercial engines for construction and lawn care companies. The iGX700 and iGX800, and their vertical shaft counterparts, iGXV700 and iGXV800, are designed to power construction equipment like power screeds, hydraulic power units, concrete saws, ride-on concrete trowels, vibratory rollers, generators and pressure washers. To make the engines more fuel efficient, Honda integrated an electronic fuel injection system with a hemispheric combustion chamber and digital capacitive ignition with variable timing. The electronic control system continuously monitors the air-to-fuel ratio and makes adjustments based on operating conditions and load requirements. Integrated electronic control units with a self-tuning regulator governor system allow for drive-by-wire remote control capability. Engine speed can be programmed based on load requirements. “Honda V-twin engines … provide durable and flexible power, excellent fuel efficiency and quiet operation for industry professionals who depend on the longevity of their equipment to get jobs done in high-demand, heavy-duty commercial, construction and rental applications,” Will Walton, vice president of Honda Power Equipment, said in a statement. The new engines also feature digital ignition systems; long-life air filters; automotive-style starter motors; low-pressure and high-pressure fuel pumps; engine temperature monitoring; and parameter-setting ECUs. Honda unveiled the new engines at the 2019 World of Concrete show in Las Vegas in January.